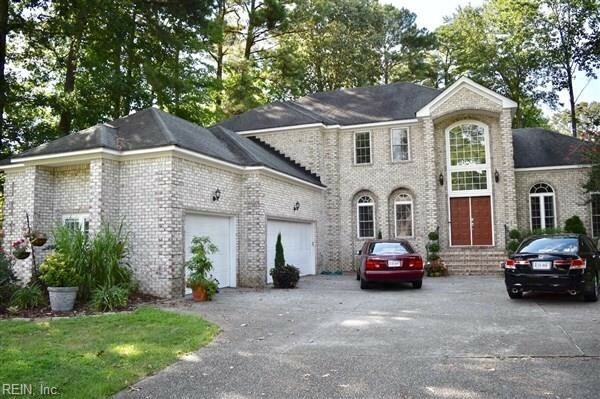 STUNNING ALL BRICK HOME ON QUIET CUL-DE-SAC, 4 BEDROOM WITH OPTIONAL 5, 2.5 BATH,LARGE MASTER DOWNSTAIRS, 3 CAR SIDE-LOADING GARAGE, HUGE DRIVEWAY FOR 5-6 CARS, BAMBOO HARDWOOD FLOORS DOWNSTAIRS, NEW CARPETS UPSTAIRS, GRANITE KITCHEN COUNTER TOPS, STAINLESS STEEL APPLIANCES AND EXHAUST HOOD, 25 CFT REFRIGERATOR, SOLID WOOD INTERIOR DOORS, CURVE STAIRWAYS, HUGE VAULTED CEILINGS, NEW -0- VOC PAINT, MASTER BATH JAGUZZI TUB, COVERED OUTSIDE HOT-TUB, NEW ACS WITH WARRANTY, NEW WATER HEATER, WHOLE HOUSE DUAL-STAGE WATER FILTER, GENERATOR HOOK-UP, ECO-FOAM CRAWL SPACE, VERY PRIVATE, LOW MAINTENANCE, VERY LOW UTILITY BILLS. NEXT DOOR NEIGHBORS HOUSES ARE OVER 50 FT AWAY ON BOTH SIDES. LARGE TREES SURROUND THE HOUSE PROVIDING SHADE MOST OF THE DAY, RESULTING TO LOW COOLING COSTS. VIRGINIA BEACH IS 25 MIN AWAY, NORFOLK AIRPORT 15 MIN AWAY, SCHOOLS 5 MIN AWAY, CHESAPEAKE GENERAL HOSPITAL 10 MIN AWAY, GREENBRIER MALL 15 MIN AWAY, WALMART, TARGET AND HOME DEPOT LESS THAN 5 MIN AWAY. Ready to visit 505 Denham? Request a free property tour! Send me more information about the listing at 505 Denham, Chesapeake, VA 23322, MLS# 10178274. This 4 bedroom, 3 bathroom home located at 505 Denham, Chesapeake, VA 23322 has approximately 3,400 square feet. It is currently listed for $489,900 and has a price per sqft of $14,409. This home is currently Off Market under the MLS#: 10178274. This listing is provided by XRealty.NET LLC. 505 Denham Arch, Chesapeake was built in 1998. It has Garage Att 3+ Car, 4 Space parking.The kitchen includes Dishwasher, Disposal, Dryer Hookup, Microwave, Elec Range, Refrigerator. 505 Denham is part of the Etheridge Lakes neighborhood located in 23322.